Kids love to swim and so do dogs. Teaching your dog how to swim can be fun and rewarding. When your dog learns to swim they can cool themselves off on a hot summer day. It is one of the best forms of exercise. In fact it’s the perfect way to rehabilitate your dog after an injury. It is also great fun swimming with your dog, but be warned they can scratch you. Labrador and Golden Retrievers have an inbred instinct to love water. In fact I caution new puppy owners that they have to watch how much water the puppy drinks. If a Labrador can’t swim in it, they will try to drink up the whole bowl and if there is nothing in the bowl then they will carry it around. Understand that just because they love water doesn’t mean that they know how to swim. Over the years I have taught many dogs to swim. Some dogs just jump in and start swimming like a pro. Others may jump in, but swim almost vertical. They don’t go very fast and do a lot of splashing. A vast majority of dogs can’t get beyond the fear of not having a bottom under their feet and some can’t even entertain the idea of getting their feet wet. You might get them to wade, but swim no way. I had one Irish Wolfhound that would swim. All the rest would only wade up to their chests. On the other hand they all loved to lie down in a little kiddy pool. The best way to teach a dog to swim is to take them to a lake were they can walk in and the water gradually gets deeper. The old fashion idea of throwing them in and the dog either sinks or swims can make a dog petrified of water. Also make sure that the water is not to cold. If you live in states where lakes and ponds freeze in the winter than you need to wait until the lakes and ponds have warmed up. March is not a good time to start. If the dog retrieves than start tossing a ball or a favorite floatable toy in the water. Make sure whatever you use is floatable. At first you toss the ball near the edge of the water so that the dog is just wading in to get the ball. Keep tossing the ball or toy a little further each time until the dog actually has to start swimming to get it. Some don’t even realize that they are swimming. Others stop going towards the ball as soon as their feet leave the bottom. For these dogs, get the ball back and keep throwing it in shallower water for a little longer. You might want to wear some high rubber boots in case you need to go in and get the toy. If possible you can attach a piece of string to the object that the dog retrieves. This will insure that you can get the object back. Don’t progress too quickly or else the dog might get discouraged and stop trying to retrieve the object. Also make sure you praise when the dog retrieves the object from the water. The buddy system is another possibility. If you or a friend has a dog that already knows how to swim. Great! The dog that never swam before might very well follow the other dog in the water. There is only one word of caution for your more timid dogs. If the dog that swims, likes to make a big leap into the water. They could splash the other dog and scare them. Also make sure that both dogs know each other before hand. For many of our Non-retrievers you may actually have to go in the water with them. Begin by walking in with the dog and then gently lifting them in the water. Make sure you support their chest. If you see that the dog is making the swimming motion then slowly move your hand away. If the dog starts to struggle than place your hand gently under them. Keep repeating this until the dog is actually swimming. It is best to stand on your dog’s side. Otherwise you might get scratched. You can also place a lifejacket on the dog to help them gain confidence. A lifejacket is a must when teaching many of your barreled chested dogs. Breeds like Pugs are one example. 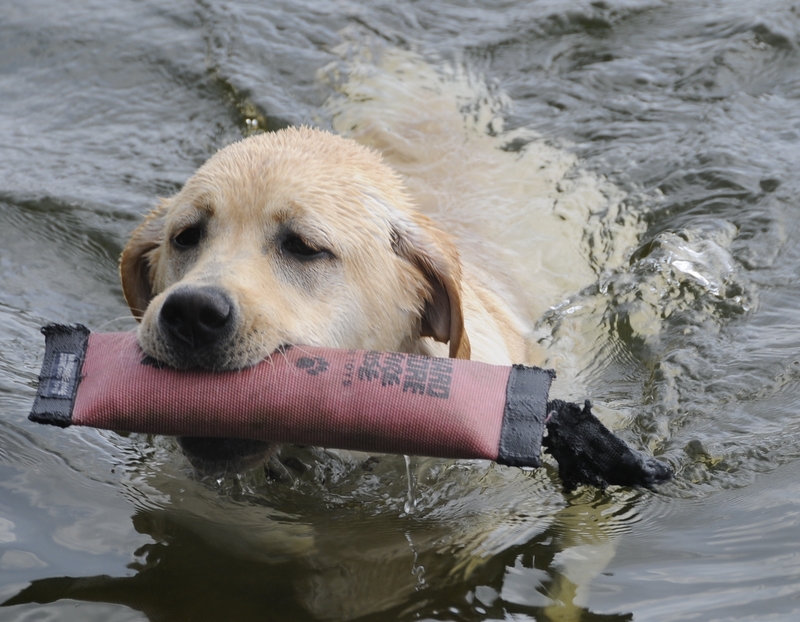 A lifejacket helps keep them buoyant, and allows them to learn that they have to kick off with their back legs. Otherwise they end up swimming vertically and will sink. I almost had to go in the water and rescue one Labrador the first time she went swimming. She jumped in and then kept going under water. She was literally going up and down in a vertical direction. Thank goodness just when I was about to get my feet wet. She started kicking out with her rear legs and started to swim. If you don’t have a lake around you then by all means you can have them learn in a swimming pool, but my best suggestion is to go in the water with them. DON’T JUST PUSH THEM IN THE POOL. This may traumatize your dog to the point that they will never even go near water. A built in pool obviously works the best, because most of them have steps that gradually get deeper. Remember take your time. Teaching a dog to swim in an above ground pool is even harder. If they are small you can of course gently left them in the water. I have taught larger dogs to use an above ground pool, but it is much harder. I first had to teach the dog how to go up a ladder and then with a friend’s help we gently lifted the dog into a pool. In fact my Irish Wolfhound that would swim first learned in an above ground pool. He was 5 months old when we started teach him how to swim. •	Don’t have your dog wear a collar while swimming. dog is wearing a collar. The collar can get caught on a branch and the dog will be stuck out there. •	Your dog can injure themselves on sticks if they are big jumpers. Once again if this is a stick pond and the dog makes this big entry leap. That stick can go right into them. •	Know what is in the water. Unfortunately some ponds and lakes are full of hazards. Fish hooks, Broken Bottles, Rusted pipes etc. •	In states where there are alligators and poisonous snakes it might be better to stay out of the water. •	Wash your dog after it comes out of a swimming pool. The chlorine from the pool can cause skin irritations. •	If you are using a long line on your dog while they are swimming. Make sure that it won’t get caught on anything. Once again getting a dog used to water and the pleasures of swimming has many benefits. That is why to me it is definitely worth taking the time to teach your dog how to swim. In fact I have had many clients want me to teach their dogs, such as, Carlos Guillen from the Detroit Tigers who wanted his Labrador to learn. This way when he went back to Venezuela the dog could swim in the ocean. Another client who wanted his dog to swim entered his dog in a Dock Dog competitions and won 2nd place.